Five Reasons to be Cheerful as a Villa Fan after Cardiff win. 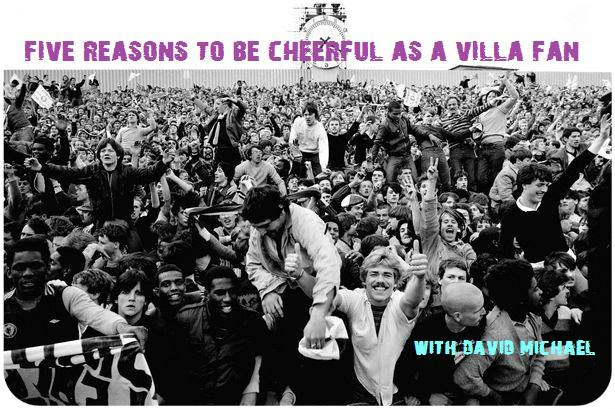 Five Reasons to be Cheerful as a Villa Fan after Blue Birds/Red Dragons/Cardiff win. 1. It took seven-and-a-half hours, but then like buses, two came along at once. Goals finally returned to Villa Park, as did a much-needed three points. 2. Leandro Bacuna’s strikes of inspiration. Against Manchester City a few weeks back, his sweet freekick seemed to inject his fellow Villa players with the desire to do the unlikely and beat City. Today, a freekick even further out, finally sparked belief in Villa, as well as ending that increasingly worrying period without a goal. It’s good to know we have a little extra-dimension when it comes to getting vital goals. 3. A clean sheet bug is catching. After waiting an eternity for any clean sheet in any league games, Villa have recorded them in their last three away games and now they gained their first clean sheet at Villa Park in 16 league games, since a 0-0 draw with Stoke on December 8th 2012. Villa’s flimsy backline was derided for most of last season, but now with pretty much the same personal, it’s hanging tough. Four clean sheets in the last eight games. Not bad. Maybe we can call Vlaar, ‘Concrete Ron’ now? 4. There were boos at half-time by some frustrated Villa supporters, but around the hour mark the Holte End could be clearly heard rousing their team onto better things. Fittingly, the players responded. Now for a nice long unbeaten home run to give fans something to really cheer about. As a foreigner, I don’t have the same local rivalry sense regarding WBA, and hate Chelsea more than any other side except Man U and Real Madrid, who are about on par…so I was pretty unhappy to see another poor call give Chelsea more points. They should have dropped points against us, and should have gotten a goose egg against WBA. But I can agree that in the end, it’s good to go into our next match even on points with them, and have it be a true clash for best team in the Midlands. UTV! Never heard of a crutch match but sounds interesting, also didn’t realise the last clean sheet at home we had was in the future?